Overview - Based on the bestselling book by Andrew Ross Sorkin, Too Big To Fail offers an intimate look at the epochal financial crisis of 2008 and the powerful men and women who decided the fate of the world’s economy in a matter of a few weeks. Centering on Treasury Secretary Henry Paulson, the film goes behind closed doors to examine the symbiotic relationship between Wall Street and Washington. There is a scene about halfway through 'Too Big to Fail' where a frustrated banking executive complains about being dragged into another crisis resolution meeting. A fellow executive turns to him and astutely responds, "You're getting out of a Mercedes to go to the New York Federal Reserve. It's not a Higgins boat on Omaha Beach." Indeed, while the characters throughout the film treat the meltdown like a waging war, there is never any blood spilt, no exploding bombs or missile attacks. At the height of the doom and gloom the various executives sit, crestfallen in their plush offices high atop New York City skyscrapers. They claim that the world is falling apart, but we can clearly see outside their windows, and everything looks just fine. The city is quiet, there's not a cloud in the sky, and average everyday citizens go about their business like nothing is happening at all -- and yet, there is a real disaster looming, it's just invisible to the naked eye. It exists on spreadsheets and dipping graphs, on hard drives and ticking stock data. Its battlefield is not the ground, but opulent boardrooms. Its weapons are not of mass destruction but rather self destruction, fueled by unfiltered greed and corruption. Its soldiers never have to get their hands dirty, never have to brave the horrors of mortar fire or piercing bullets. Theirs is a war of mergers, bailouts, bankruptcies and bubble bursts. While any comparison to actual combat is laughable, the crisis is still very real, exposing an extremely familiar type of financial ruin evolved from the horrors of the Great Depression -- an economic civil war where perception is paramount and credit is the most precious commodity. While the country silently crumbles, our fates are in the hands of a small collection of well dressed men sitting in big conference rooms. Through a stripped down but still compelling style, HBO's 'Too Big to Fail' details their efforts to avert fiscal oblivion. Based on Andrew Ross Sorkin's nonfiction book of the same name, the story focuses on the devastating 2008 economic crisis, and its resulting affects on Wall Street banking and the U.S. economy. When financial giant, Lehman Brothers, starts to go under, the government and private sector attempt to find a solution, hoping to thwart the beginnings of a total economic meltdown. Led by Secretary of Treasury Henry Paulson (William Hurt), the uneasy alliance between politicians and bankers is forced to resort to fairly unconventional strategies. As the escalating crisis begins to take a heavy toll on Paulson's well being, the country heads closer and closer toward a new Great Depression. Through a combination of ingenuity and desperation, the government and bankers will have to find a workable resolution, or suffer dire consequences. At its core, the film is really nothing more than a series of conversations, conferences, and phone calls that follow the sprawling cast of characters as they embark on damage control. We move from closed door meeting to closed door meeting as the government and bankers spitball possible solutions to the escalating crisis, and continually deal with each new catastrophic development. While this may not sound all that engaging on paper, the movie does a nice job of making the potentially dry content compelling to watch. There's only so much a filmmaker can do to dramatize real world events like this, and the director and writers offer an effectively gripping but never sensationalized take on the material. Of course, given the unbelievable realities of the actual crisis, the narrative hardly needs additional embellishments. There is a palpable sense of desperation on screen as the characters start to grasp at straws in order to keep afloat. The dilemma evokes heady questions about the government's place within economic disasters like this, and there are no easy answers given. The fickle, fragile nature of our economy and its easy susceptibility to greed and corruption are examined, and the events grow increasingly infuriating to watch. By the end of the film, the characters are spitting out monetary figures so large that they essentially have no meaning, and I was suddenly left feeling like the ending of 'Fight Club' might not be such an unrealistic option. Despite the many commendable qualities of the scripting and direction, the approach is not without a few potential problems. Those unfamiliar with the details behind the 2008 economic meltdown will likely be a little lost throughout the runtime. The machinations that led to the financial collapse are quite complicated and involved, and the film mostly thrusts viewers head first into the story. Characters and situations are introduced quickly one after another, and the laundry list of businessmen and public servants can be daunting to follow. In fact, the film's sprawling cast and complicated politics present an experience not unlike an episode of 'Game of Thrones.' Just replace the ravens with Blackberries, the swords with checkbooks, and the greedy lords and noblemen vying for power with -- well, actually, that part's the same. Though difficult to follow for the uninitiated, the movie does eventually find a nice rhythm, and there are a few scenes later on that do a solid job of filling in the background details. Due to the plot heavy focus, character development is quite sparse. The cast (which includes Billy Crudup, Paul Giamatti and James Woods) does a nice job of portraying their respective real world counterparts, but there is little to invest in on an emotional level. The story is really aimed at the events and disaster itself, and there are times when characters are really nothing more than mouthpieces for information. With that said, Henry Paulson does ultimately emerge as the film's protagonist of sorts, and there are some brief but effective instances of strong character work from William Hurt that help to add a human layer to the proceedings. While some other takes on the economic collapse have not been particularly kind to Paulson, here the filmmakers present the Secretary of Treasury in a sympathetic light, and one truly gets a sense for the impossible stress and pressures he faced. The exact reasons for the economic collapse and the potential merits and faults of its subsequent cleanup are still hotly debated, but thankfully the movie avoids any kind of specific political leaning or bias. Though touched upon, this really isn't a story about the hows and whys behind the meltdown -- it's a story about the scramble to find a solution. Playing any kind of blame game isn't the main goal, and though greed and corruption on Wall Street are singled out as the main culprits behind the devastating consequences of the real estate burst, the film exposes irresponsibility, poor decision making, and short sightedness on all sides. In many ways, 'Too Big to Fail' is an absolutely terrifying and utterly depressing film. Though dramatized to a certain extent, the movie mostly sticks to the facts, revealing just how close our country came to a complete catastrophe. The long lasting ripples of the 2008 economic collapse will continue to reverberate for years to come, and one can only hope that Wall Street, the White House, and the American people learn from the mistakes of the past. Though the complicated events can be difficult for the uninitiated to follow, and the plot heavy focus does lack a substantial emotional component, the film still proves to be exciting, frustrating, eye opening, and at times fascinating. Throwing money at problems can only work for so long, and if a collapse like this happens again, I fear that even a limitless pile of blank checks won't help save us. As the movie reveals, the very culture of our financial institution is in need of a refresher course in ethics. For the time being, it appears that our fates continue to be in the hands of well dressed men sitting in big conference rooms. To be honest, I'm not so sure how I feel about that. 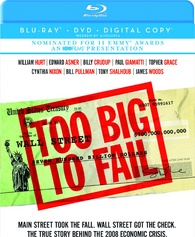 HBO presents 'Too Big To Fail' on a Blu-ray/DVD/Digital Copy Combo Pack. A BD-25 disc and a separate DVD disc are housed together in a keepcase with a cardboard slipcover. Instructions for a redeemable digital copy are also included in the package. After some warnings, logos and a skippable HBO promo trailer, the disc transitions to a standard menu. The release is region A compatible. The movie is provided with a 1080p/AVC MPEG-4 transfer in the 1.78:1 aspect ratio. Mostly just a series of conversations in various offices and hallways, the filmmakers do what they can with the inherently mundane settings, offering a solid but never very impressive video presentation. The print is in excellent shape with a nice clean aesthetic that features a very light layer of grain periodically. Overall clarity is good but fine details and textures are not particularly sharp, resulting in a predominantly soft appearance. The color palette can be a bit muted, favoring teals and yellows. Contrast is on the low side, resulting in a somewhat dim picture that lacks pop and dimension. While slightly elevated in a few shots, black levels are never problematic. 'Too Big to Fail' isn't a real stunner in high definition, but the modest aesthetic seems to be intentional on the filmmakers' part. Colors aren't very vibrant, brightness and contrast lack punch, and detail is never razor sharp, but the video manages to serve the content well without any major technical problems. The film is presented with an English DTS-HD Master Audio 5.1 mix, a French DTS 5.1 mix and a Spanish DTS 2.0 Surround mix. English SDH, French, and Spanish subtitles are available. While certainly serviceable, the audio fails to ever truly engage, offering little sense of immersion or atmosphere. This is a dialogue centric movie, and thankfully speech is clean and prioritized nicely throughout. Unfortunately, effects work is minimal leading to a small soundstage. Directionality and surround activity are present in brief, isolated instances, but even a general sense of ambiance is often missing from most scenes. With that said, certain cues in the score do find their way around the room and some flashing cameras and a soaring plane provide fleeting bursts of auditory life. Dynamic range is decent but the content never really calls for much variety and bass activity is mostly negligible (though there is some low frequency rumble in the score). While I understand that this is a conversation heavy film and not some big action blockbuster, the design work present still feels a little lackluster. I'm certainly not advocating obtrusive effects simply for the sake of filling the room with sound, but subtle layers of background activity could have helped to envelop the audience a bit more. As it stands, this is a perfectly fine audio presentation, but for a 5.1 track it fails to really engage the viewer with anything beyond the bare minimum. HBO has put together a pretty slim collection of supplements. All of the extras are presented in 1080i with DTS 2.0 sound and the same subtitle options as the main feature. The Making of Too Big to Fail (HD, 2 min) - This is an extremely brief look at the making of the movie that features quick bits of behind-the-scenes footage and cast/crew interviews. Basically, this is too short to matter. Opening the Vault on the Financial Crisis (HD, 19 min) - Here the focus is on retracing the actual events that led to and then occurred during the 2008 Economic Crisis. Various experts and cast/crew from the film address the movie's major beats and characters, elaborating on them in greater detail. While only a cursory glance at the complicated issues, the feature does a nice job of complementing the film and should help to clarify some things for viewers who are unfamiliar with the crisis. Timeline of a Crisis - An interactive timeline that features short descriptions of the major events during the financial crisis from October 2007 to November 2008 is included. 'Too Big to Fail' is an eye-opening and compelling dramatization of the 2008 economic meltdown. While character development takes a backseat to plot, and those unfamiliar with the crisis might get a little lost, the film still manages to enlighten and infuriate with its no nonsense approach to the startling real life events. The video transfer is good but the inherent nature of the content lacks impressive pop and variety. Though completely serviceable, the audio mix fails to immerse the audience. Supplements are disappointingly sparse, but some decent background information on the crisis is included. This release from HBO isn't a complete homerun, but the disc succeeds where it counts and the film is definitely recommended.